Autoire is found in the hollow of a cirque on the lime stone plateau between Figeac and Gramat. In this arid land, only the Autoire, a fast-flowing stream that lends its name to the village, brings freshness from its waterfalls. A beautifully preserved ancient Quercy village of character, with an 800 year history, undisturbed by the modern world. 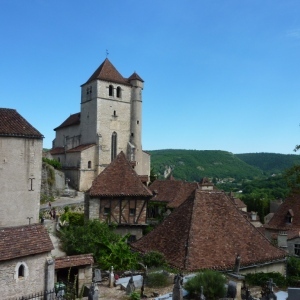 This immaculately preserved village rests in a small valley dominated by the imposing limestone cliffs which mark the edge of the Causse, the foothills of the Massif Central. 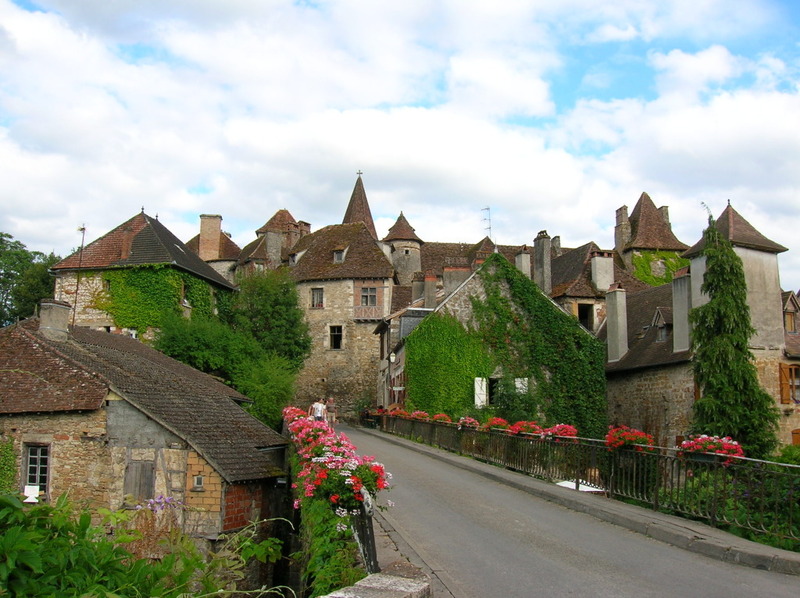 Autoire is a typically Quercynois village where architecture and natural surroundings are in perfect harmony. The splendid houses within the town bear witness to an age when Autoire, residence of bourgeoisie and nobility was called “le petit Versailles”. The village has preserved its authenticity and is little changed today from ancient times. Agriculture is still the mainstay of the village surrounded as it is by lush green meadows, rows of vines and orchards of “prunes Reines Claudes”. View Autoire | Things to See and Do in Autoire to read more about one of the Most Beautiful Villages of France in the Lot. It has been inhabited since prehistoric times. Within a stone’s throw from Figeac, the medieval fortress of Capdenac-le-Haut is built high up more than 110 meter above a meander of the Lot river. The village is also one of the most important Gallo-Roman site of the region, known as the seat of the last Caesar’s battle in Gaul. 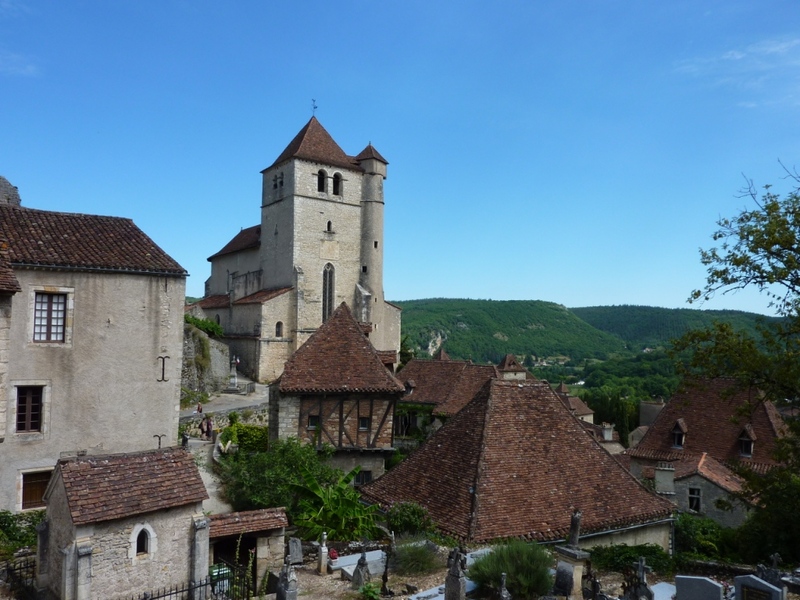 The village of Cardaillac sits on a rocky outcrop in Haut Quercy. It takes its name from the feudal family that built it and brought notoriety and prosperity to the area. Two famous Lords of Cardaillac were Guillaume V founder of the abbey of Leyme and Marques who defended Quercy during the hundred years war. Cardaillac is situated in a beautiful wooded landscape intersected with small secluded valleys. This fortified medieval village has the appearance of a miniature castle with its three stone towers. Inside its walls you will find narrow lanes with a central gutter curve between houses built of ochre coloured stone from the Quercy. Many details of the architecture remain original, or have been carefully restored to maintain the unique historical feel to the village. This gorgeous village sits on the banks of the Dordogne river, within the department of the Lot. Carennac has been a site of human habitation since Neolithic times. The area is mentioned in records from the 10th Century and in the 11th was given to the abbey of Cluny which founded a priory there. Badly damaged during the hundred years war, the buildings were restored in the 15th Century, but further devastated during the religious wars. St. Peter’s church, by the fortifications of the monastery, retains a number of features from the Middle Ages. Its beautiful cloisters lead to the Chapter Room which contains a famous entombment, an almost perfect sculpture of the late 15th Century. The village rose up again in the 16th century with the building of the Dean’s chateau in locally quarried white stone. 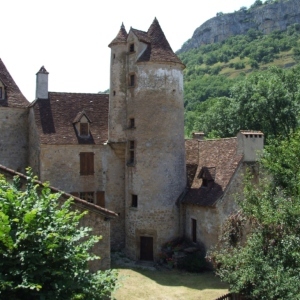 Today the chateau houses the “Maison de la Dordogne Quercynoise” and its year-round exhibition on the region. In the following century Fénelon, Dean of Carennac, is said to have written his famous Télémaque (Adventures of Telemachus), published in 1699. The island opposite the village is still named after Calypso. View Carennac | Things to See and Do in Carennac to read more about one of the Most Beautiful Villages of France in the Lot. 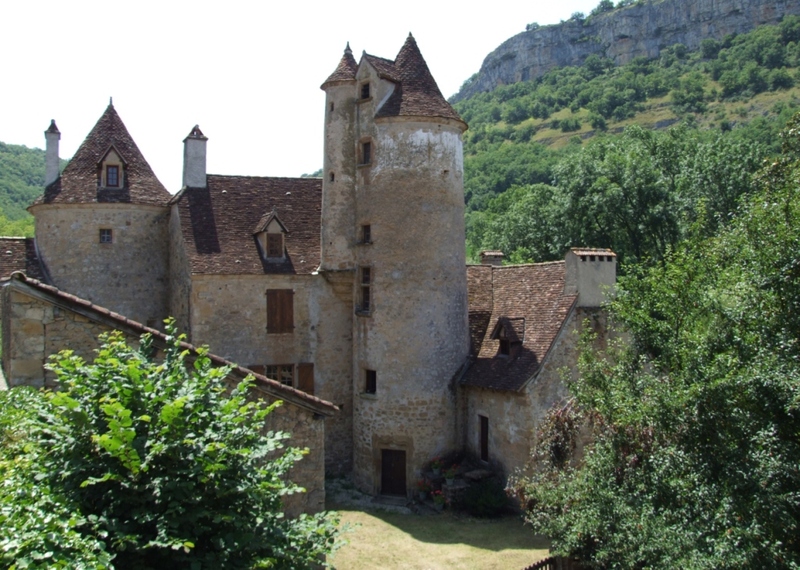 Perched on a promontory that offers a wonderful panoramic view of the Dordogne valley and the surrounding castles, Loubressac invites visitors to discover its charming medieval houses built of ochre stone and capped with pointed roofs. The church of Saint Jean Baptiste and the château, a manor dating back to the 15C and 18C, are worth the short climb it takes to reach them. View Loubressac | Things to See and Do in Loubressac to read more about this Most Beautiful Village of France in the Lot. The village of Saint-Cirq Lapopie is perched on a cliff 100 m above the river and is one of the major beauty spots of the Lot valley. 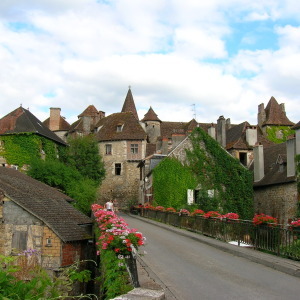 In the Middle Ages, Saint-Cirq Lapopie was the main town of one of the four divisions that made up Quercy. It was divided between four feudal dynasties, the Lapopies, Gourdons, Cardaillacs and Castelnaus. The village was dominated by a fortress made up of a number of castles and towers. Below the fortress, the village streets lead down to fortified gates. Many historic houses have stone or half-timbered fronts going back to the 13th-16th centuries. The houses are narrow and have steep tiled roofs. The gabled houses fronting on the street are separated by a narrow space called an entremi, which carried away rainwater and waste from sinks and latrines. Some street names have kept the memory of the crafts that were once the wealth of Saint-Cirq Lapopie. Hide merchants in the Rue de la Pélissaria, metalworkers in the Rue Payrolerie, and boxwood turners, or roubinétaïres, with workshops producing button moulds, trenchers, goblets and spigots for casks. Many painters came to live and work in Saint-Cirq Lapopie. First the Post-Impressionist Henri Martin, then the Surrealists with the poet André Breton, who said he would not want to live anywhere else. Beneath the Saint-Cirq Lapopie cliff there are water mills, weirs, harbours, locks and towpath to recall the days when river transport was the glory of the Lot Valley. View St Cirq Lapopie | Things to See and Do in Saint-Cirq-Lapopie to read more about one of the Most Beautiful Villages of France in the Lot.